My working space is where I am now—and it’s perfect. 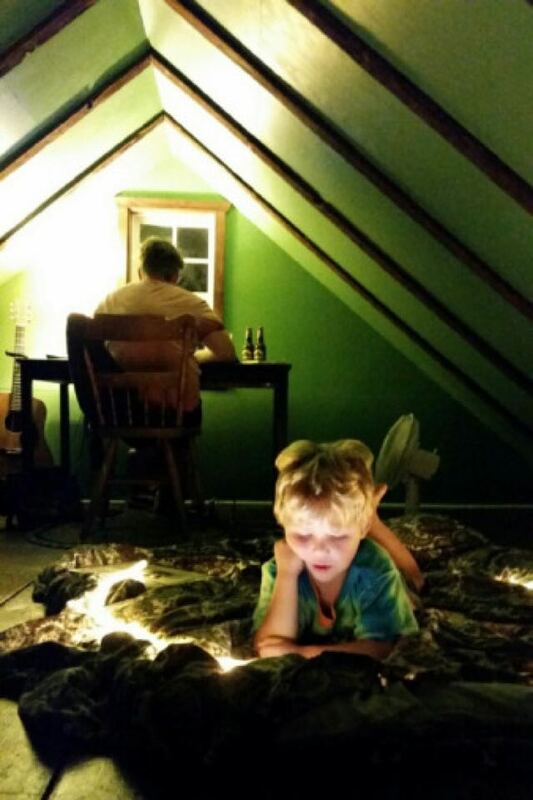 It’s my attic, redone into one of the most pleasing spaces I can imagine for writing. It’s odd, like my writing, and it fits me. Not only is it lofted into my bedroom, but its wood floors are solid pieces of oak from 1857, stretching straight across, wall to wall. There’s history here, and I feel like I have a place in it, which in itself is a wonderful feeling. Each time I go up, I flip the latch, open the small attic door, and climb narrow steps, dangerous and steep as hell—this alone makes it feel like a hideout, a secret place where if I’m not careful I’ll crash down, breaking myself in the process. And where the planks end, at the wall, where my desk sits underneath a single window, that’s where I feel most happy and connected to my writing, to my home, to my family. On any good day like today, it’s here, seated in front of my computer, seated at the top of my house that I can hear everyone and still write. That’s the thing, I don’t close the door, and the room itself lofts into my bedroom, so I’m in the open and still connected—still writing. It’s a hideaway that allows me to stay in the loop. My family knows I’m here now, and they know what I’m doing—so I do it. I write. I’m writing right now, and it feels good underneath this arched ceiling coated in calm library green. It makes me want to write even more. And what’s really good about it—the best thing about my working space—is that it prepares me to write when I’m not there. Because, let’s face it, sometimes you have to write in the thick of it, surrounded by life. Working spaces are great, but they can be anywhere, and that’s important too. On that note, my preferred working time is early morning, which is why I’m up here now; then again, it’s already 11:00am. That’s the thing, I get lost in my work fairly easily, which is also probably why it’s now 11:00am. I start early, and if I don’t pull myself away, I’ll stay up here all day—obsessively. Of course, I won’t let myself. I recognize that it becomes unhealthy. And, in fact, right now, already, I’m starting to lose a bit of the steam just because I know that as much as I love writing, I love my family down below. But, all in all, I find it incredibly easy—and immensely pleasing—to write in the morning, as I have today. It’s just the right time for me. Then again, this is a Saturday. During the weekdays, it’s usually only a quick line or two, and most likely right before I head out to my teaching job. Sometimes it’s just me reading the line I wrote the day before, finessing it in the right direction. During the school year, it can be a slow process during the work week, but it gives me perspective; it’s small brushstrokes I’m making with my morning writing. The weekend is a different story of course. I can disappear before anyone wakes and I can write until they come get me, and more and more, like today, they let me write. My children climb the attic steps, just as they have this morning, and they chat me up, then disappear or sit behind me. It’s nice. These are wonderful mornings. Today is a wonderful writing day. And what does a typical writing day in terms of my process look like? Well, it depends on what point I’m at in the story. But often enough it’s me generating an idea, sitting and thinking. I enjoy that immensely, dreaming up stories, thinking about the craft of it. Once the story idea is fleshed out in my head, beginning, middle, end, then I pick up the notebook or my phone and set about recording the bones of it. I like to think out the story with notes. So My Mother, She Lives in the Clouds , Christopher’s debut short story collection. Often in doing so, I begin writing the piece, giving the narrator a voice. From there, I switch it over to my Chromebook, opening a new Google doc, and typing the title onto the page. It almost always begins with the title. The title is my unifying point. It’s like me calling a friend over, saying, “Hey, do you know why wolves take the calves first?” and then I show them with a story. Once the title is written, the story begins, and it takes me a long time to craft a story. Usually, I’m in the middle part of the process, which is where I am today. Today I’m picking at sentences in a story about a girl and her father. The mother is missing and the relationship is not cold, but not quite right between the father and the daughter, so I’m making sure their exchanges sound like that, like something is missing. I love this part, this revising and crafting my sentences until I have them where I want them. For almost two hours this morning, I’ve been revising 870 words, going over them line by line and making sure they add up to spell—loss, missing mother, pain, relief in grief. And I’ll keep at it for another fifteen minutes, until the daughter in the story cries just right or until I’m so cold in my attic that the words I type jumble and cease to carry the warmth I need them to—for the reader. Christopher D. DiCicco was born in Pennsylvania during the winter of 1981. He lives by a canal and writes fiction in his attic. 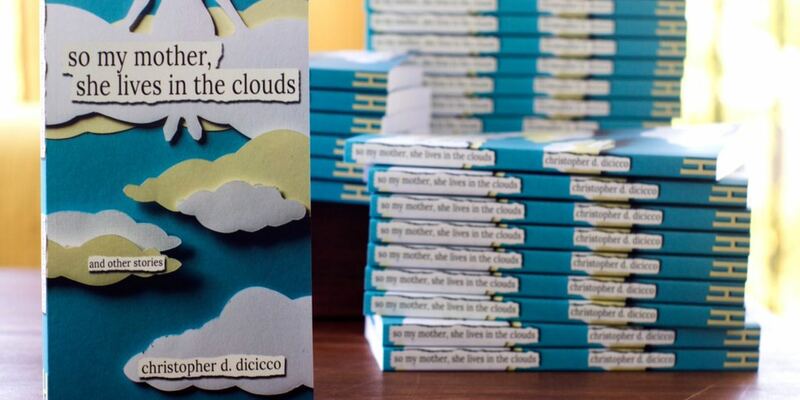 So My Mother, She Lives in the Clouds (Hypertrophic Press, 2015) is his first collection. His work has appeared in numerous journals, such as Atticus Review , Superstition Review , and Fiction Southeast .